The Four Points Foodie: Follow and be rewarded; my early summer give-away! Follow and be rewarded; my early summer give-away! I love William Sonoma - from their kitchen towels and spatulas to their mixing bowls and cookbooks. Just stepping inside my local store gives me a feeling of exhilaration. I want my followers to have that same feeling so it's time for my early summer give-away! Follow my blog - it's that easy! One lucky follower, whether current or new, will be chosen as the $100 Williams Sonoma Gift Card winner. This contest will end on June 19th and the lucky winner announced on Monday, June 20th. Tell your friends, tweet it out, share on Facebook and follow my blog... it's that easy! We just signed up to follow your blog. Thanks for the giveaway! I get that same feeling when I walk into Williams-Sonoma. I am following. 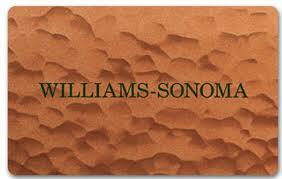 I am on board-Williams Sonoma is a fantastic gift card! Beware-your follower list is about to explode! That is a great giveaway! I'm following!